Time For Your "Mind Gym" - Who's Your Hero? You meet new people all the time, but move closer to some selected few. Some strike you as really outstanding - more like "heroes" who'll save you in some way. Like magnet, they attract you with their most amazing qualities. Then, you find yourself seeking them in every possible way. When that happens, it reflects something about you. You either want that person to bring out something in you, or you want to be like that other person. It's not only about having them for company. Think about your heroes for a moment. What do you appreciate most about each? This is what you (probably) have missing. You may start modeling that person (with or without conscious attention). You may start wearing their mind. You may start walking in their shoes. They inspire your thoughts & influence actions. It has been said that the best helping hand you'll ever find is that at the end of your own arm; and that you can't push anyone up the ladder unless they move their feet frequently upwards. 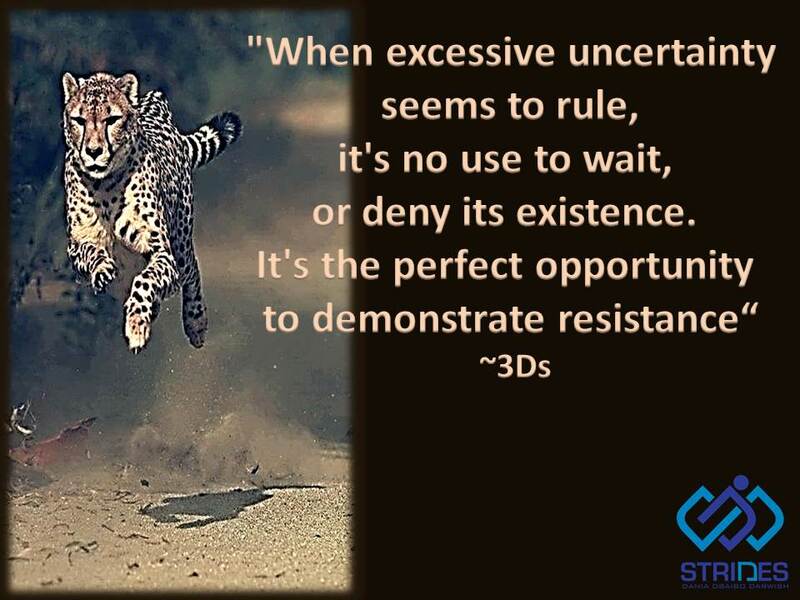 Time For Your "Mind Gym" - How Do You Face Uncertainty? It's, perhaps, this uncertainty that mostly induces anxiety and distress over what can come next. "How will the future be like?" you wonder. - Or keep planning your life as before , do what you're used to doing, and deny that external powerful circumstances may eventually lead you to a dark place. But wait.... there's a third alternative to go about it. Consider the "waiting time" a chance to do what you never had the time to do before the overwhelming uncertainty barged in. To feel more in control, change anticipation into having plan "A", "B", "C",... Build walls of defense to combat incipient feelings of stress. And affiliate with those facing similar uncertainty, or ask for assistance. Trampolining with you ;) Eeeee-Haaaaa! 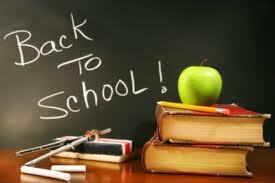 “Back to School”: Parental Tips for a Great Start! It’s school time again! It’s a time for a lot of preparations; a change to a more organized routine; an exciting time for many kids; and perhaps a stressful period for some parents and even some children. It could be a challenging task, at first, for kids to switch gears from a fun filled vacation to school learning again, but parents can play a major role in getting their children prepared for yet another milestone in their developmental journey. I have addressed several questions many parents have at the start of yet another academic year in an interview for "Parenting Family Magazine". Keep reading if you're interested. How can parents motivate their kids about school beginning again? - - Going up one level and becoming closer to being adults. - - New learning experiences and knowledge that increases their information tank. - - How their brains are developing and becoming more efficient to analyze and store information. - - The privilege they have compared to those who cannot afford a good education. - - Having new teachers and making new friends. - - Getting organized again (and make setting structures for the new routines more like a game). - - Still having some time to play and have fun in allocated times. But kids will have less free time. How can parents overcome the kids’ nagging to have “play time”? - - Buying new school goodies with the child (e.g. bag, lunch box, stationery, etc…). Take the child to actually choose and buy the necessities. - - Spread the new school supplies in the child’s working area and make it exciting to use these in variations to initially help kids be back on track as they do their homework. - - In the mornings, do a friendly race between them and you, or other siblings on getting ready. Whoever wins gets extra “play time” or other rewards. Make mornings fun. - - Dangle the carrot always for “play time” (i.e. specify breaks after finishing up some assignments). - - Get them involved in school activities if available, or other outside school activities. - - Teach them how to make new friends and participate in dong that by inviting friends over to the house, or other activities. - - Stress that there will be short breaks and vacations, in time, to catch up with more free or “play time”; and plan special activities for those periods. Aren’t school routines boring and restrictive to kids? Not all routines are bad; and of course kids will complain at first, but deep inside you’ll find them settling down after a somewhat chaotic summers. For children, having a clear routine to follow enables them have structure in their lives; and that in and of itself is beneficial to both parent and child. 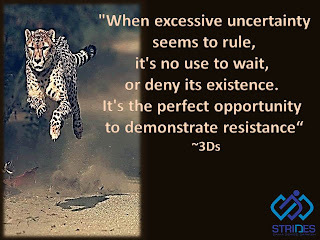 It helps set a platform of better control and certainty of what’s coming next, without which stress may ensue. Parents, therefore, need to set expectations for the new timing of different activities; and from the beginning be clear on the new seasonal routines, like: meals, bed time, study hours, play hours, activities, and weekend schedules. How can parents comfort anxious kids about school starting again? - - Encourage having an open dialogue with their kids and calm their worries by talking it out and giving assurances. - - Ask kids what would help them be more relaxed and secure. - - Boost their confidence that they will manage on their own at school. - - Demonstrate actually being there for the kids at promised times both at school and at home until they ease up. - - Discuss with kids good things that happened in school upon their return. Sleep regulation may be the toughest to handle. What are the recommendations for healthy sleep patterns? - - For younger kids, an hour to unwind and get ready to bed is needed (i.e. to give time to shower, get dressed, bed-time story, etc….). - - Pre-school and elementary students need an average of 12 hours sleep a day. - - Teenagers and high-schoolers need an average of 8 hours sleep a day, but end up falling short of that due to assignments and exams. - - Keep stressing how mood and academic performance get negatively affected with sleep deprivation. How involved should parents be with their kids’ finalizing their homework? Well, that depends on the child’s age. Parents get very involved perhaps till grade 5 after which they need to start letting go gradually. Children need to learn to take initiative and responsibility in doing their own homework without aid. Parents may remain a “point of reference” at all times and only when necessary. Some parents do more harm than good by being over-involved in finalizing their child’s work. Over-involvement results in the child being dependent on others when what the child really needs is to become progressively autonomous and build their confidence. Up until grade seven, parents may need to check on their child’s work daily; after which just the physical presence of the parent can be of great help to monitor progress from a distance. Even if kids become independent in doing their school work, it’s better if parents maintained daily interest and inquired about any challenges, deadlines, and other concerns. Are there any other tips to make it a great new school year? - - Maintain the channel of communication open (avoid dictating orders and advice giving all the time). - - Do fun activities even in the confinements of the home. Simple things like these require a clear mind and a lot of energy. Parents need to make sure to allow themselves the time to relax and “recharge their batteries”. This helps them satisfy their kids’ needs. A stressed out parent results in a stressed out kid. If parents keep boosting the child’s confidence in his/her abilities, the child will definitely succeed as adult. Isn’t that what all parents aspire for their children? Time for Your "Mind Gym" - How Do You Face Failure? Success & failure are flip sides of the same coin. When you succeed, it's like a dream come true. You rejoice. You're thrilled to do more. You're happy. When you fail, & you do interpret not reaching your dream as "failure", then you become discouraged, sad, & may consider giving up your dream, right? But what if you re-frame that "failure" into a learning lesson of what does not work. This is what Thomas Edison did as he attempted to invent the light bulb some 10,000 times. Each time it wouldn’t work & he’d try again differently until he finally succeeded!! Had Edison given up, we wouldn't have enjoyed the luxury of electricity. Same thing goes for whatever you really aspire to do especially tough endeavors. You need to be aggressive at getting it right. When things don't turn out as you want them to, you certainly need to change your strategy. If you keep doing the same thing in the same way every time, you'll get the same results each time. The sky is definitely not the limit to what you can do when the world "failure" ceases to exist in your dictionary! Time For Your "Mind Gym" - How Did You Self-Brand So Far? You most certainly are familiar with different brands (i.e. Apple, Nike, Porsche, Nokia,...). Each was marketed through different means & attracted loyal customers (or not for that matter). We, humans, similarly market ourselves; Not to customers necessarily, but to other people around us. We create an impression, an image, & a memory; thus, stirring up a specific set of emotions in others at our sight (or even if it was only our name mentioned). Some people don't give self-branding the conscious effort consumer commodities are given. 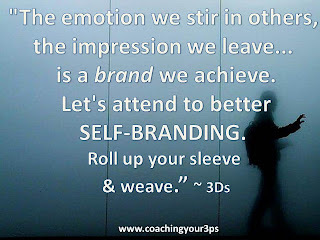 They are not aware of how they're self-branding, but they are branding themselves, by the minute, anyway. - What do others say is my greatest strength, or outstanding trait? - How do I stand out from the crowd? - What is my emotional impact? - What am I most proud of? - How would I like to be remembered? 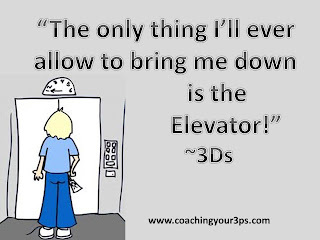 Time for Your "Mind Gym" - What Brings You Down? Feeling up or down is part of your fabric. 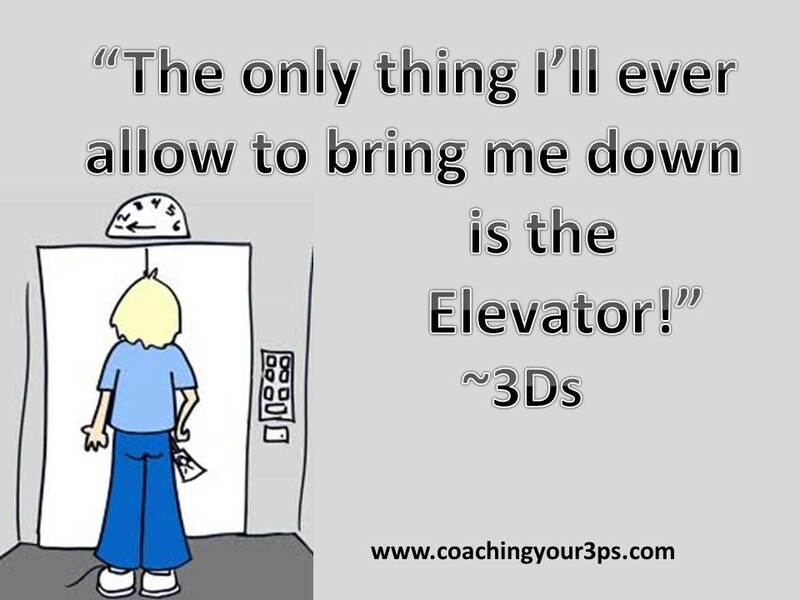 Your thoughts, behaviors, other people, & surrounding circumstances fuel your going up or down that emotional roller coaster. Unless you're the depressive type, I am sure you enjoy the more elated states. You see practically everything in rosy glasses. You feel alive. When you're feeling down, you see only the dark. Even your shadow leaves you. You get less productive. Life makes no sense. And you may keep fluctuating between the two poles depending on the factors with greater influence (i.e. your thoughts, your behaviors, other people, or surrounding circumstances). It's okay if you do. It means you're human. But it's not okay to leave yourself in those down states way too long. They wear you out. They bring you totally down. Nothing has the power to keep you in the gutter if you don't allow it. And by no means am I suggesting you live in denial that life gave you a blow. But it makes a difference if you kept yourself in the low for long. Soon enough, you'll realize the only way out is back up again. 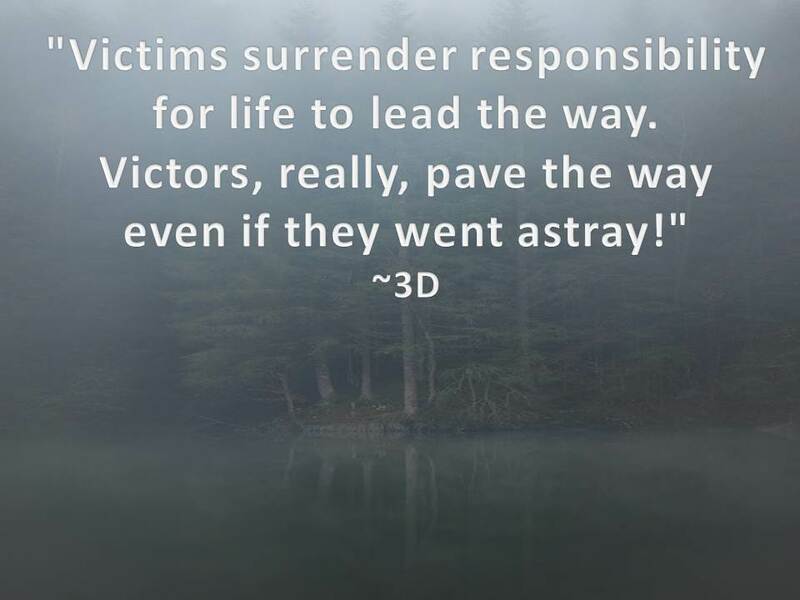 Time for Your Mind Gym - Are You a Victim or a Victor? It can, also, feel as if you're in a boxing match, getting knocked-down - one blow after another. 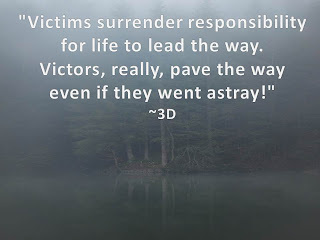 Still, you're never really defeated when you fall until you refuse to get up! Have you ever noticed that in your head, two voices may compete? One says: rise up & fight back; the other says: let me stop giving a damn!! Turn the volume louder for that! Fine-tune its wave length as you proceed! Turn that volume up, as well, for that self-coach voice yelling: "Fight back!! Fight back!!" Put your seat-belt on & let the navigation BEGIN!! Steer the wheels!! Turn the music on!! Oh, and don't forget to check: which volume is up again? Your Mind Gym - How is it Like in Your Relationship? Pick any important relationship in your life & assess. How's it like? It could be rocky, or smooth; filled with turmoil, flat-lining, or flaming with joy. What do you think makes a difference? If you think hard about it, you'll find that the "smooth" & "flowing with joy" relationships have agreements on core life values you share with the other. If it's your partner, friend, colleague, parent, sibling, or kid, you're assessing your relationship with, you'll realize that the more you're like each other, the more you like each other. Still, no two people are alike. And if you focus on your differences, you, surely, head that "rocky" road describing how your relationship is like. Rings a bell in any case? If you really want to hold on to having them in your life, what are you to do if you were to smoothen the path both of you walk? Examine the whole package. Acknowledge & accept the differences. Focus on your similarities & bring these to spotlight in your interactions. It's been said that thriving relationships have a ratio of 5 positive interactions to each negative one, usually. Perhaps it's re-engineering time of how it's like. Think hard. They have abundant material you can use as cement. Start mixing: a trait here, a behavior there, dash of love, & sprinkle all with understanding. Your "Mind Gym" - How Are The News Like? If you're the type who constantly follows up on TV News, then you're the type who's constantly showered with doses of negativity. 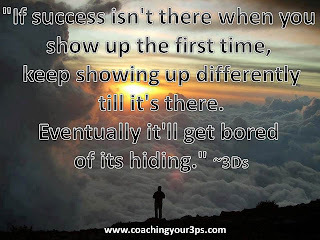 By the time you've had enough, you can expect to hear about few good news of "wins" here or there. Same thing happens if you read the newspaper. Negativity...Negativity... Negativity.... And then finally some good news (perhaps in the sports page). And again by the time you're there, the good News are barely noticed. Global News eventually have their impact on your own, don't they? Perhaps I am one among many who stopped attending closely to that barrage of negativity. I'd like to pay attention to those News within my reach - the closest of which are my own. Feels familiar? So many times, our own bad news witness their own barrage as if their flood gates sprung wide open. And we stop paying attention to the good news here or there (just like those global news we get from TV & the Newspaper). 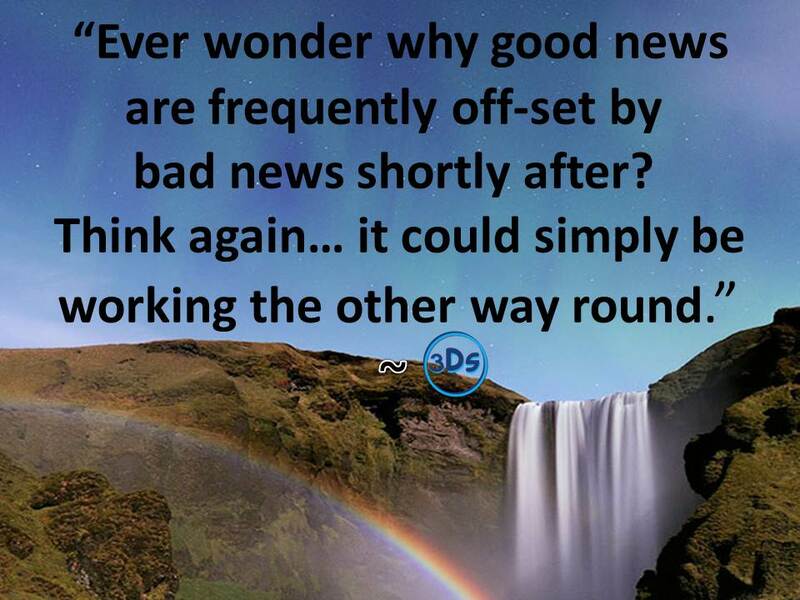 It seems that we get programmed to focus on the bad news. These attract our attention more than the good ones; and we grow to give these more time & more energy (just like the TV & the Newspaper). And then, no energy is left to appreciate the good ones. But what if we focus instead that good news are coming after the bad ones? Does that trigger an "A-HA" moment? Thank you for being curious enough to read my Blog. You'll find a lot of traffic in my thoughts. Ideas, that only few people take the time to write about. I have only recently decided to publish & share these. Some are deep, few are outrageous, others may be dynamic, & most are based on my own observations. 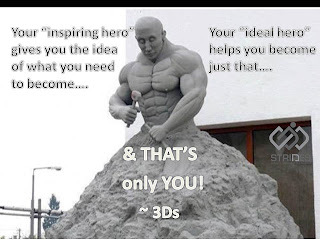 Above all, these thoughts express my sincere attempts at: continuous self improvement & guiding others improve their own. Work – life balance – who has it? Setting up a small business? It’s Yom Kippur, So How Do You Measure Up?